There are a nearly limitless number of holidays in Canada to choose from. Canada features many different climates and landscapes, each with their own unique form of natural beauty. From the old world charm of eastern Canada's village life to cosmopolitan cities like Montreal and Toronto, the majesty of the Canadian Rockies, the vast wilderness and tundra of the Northwest Territories and the Yukon and the Pacific coastal splendor of British Columbia, Canada offers a lot of choices to vacationers. One particularly gorgeous part of Canada is the coastal town of Tofino, British Columbia. Located at the tip of the Esowista peninsula on the west coast of Vancouver Island, Tofino, British Columbia is only about four hours from the city of Vancouver but is worlds apart from fast paced city life. It's a place which is unlike any other and is popular with those looking to visit Canada while seeing somewhere a little off the beaten path. If enjoying aquatic sports or just being near the ocean is your ideal vacation, this is the place to be. Whether you want to experience ocean kayaking on the Clayoquot Sound or enjoy whale watching off Long Beach, Fresh Tracks can help you plan a Tofino, British Columbia adventure you'll always remember. Tofino, British Columbia is a one of a kind place for Canadian vacations and there is enough to do here to keep you active and entertained on your vacation. Surfing: That's right! There is surfing in Canada and Tofino, British Columbia is one of the best places in the country to catch a wave! The town and nearby Long Beach, BC attract many surfers in the summer season and there are many shops where you can rent surfboards for the day. Ocean kayaking: Kayaking on the open waters of the Clayoquot Sound, largely sheltered from the turbulence of the ocean is an incredible experience. There are guided kayaking tours available as well as a kayak launch for more experienced kayakers. Whale watching: There are numerous whale watching tours available in and around Tofino, British Columbia. 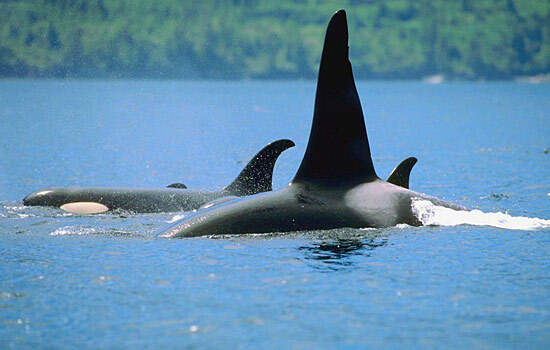 You can spend a relaxing couple of hours on the water and thrill to the sights and sounds of grey whales and with luck, even orcas (killer whales) in their natural habitat. March is one of the best times to visit for whale watching; this is when thousands of grey whales arrive in the area on their annual migration, coinciding with the Pacific Rim Whale Festival. Hiking and wildlife tours: The west coast of Vancouver Island, British Columbia is one of the world's most beautiful places and bears, seals and many types of birds can be seen and admired while you visit Canada's Pacific coast region. Summer festivals: Tofino, British Columbia hosts a number of festivals and other events which celebrate local cuisine and culture each summer including the Tofino Food and Wine Festival in early June, Augusts' Tofino Lantern Festival and Art in the Gardens, a music and arts festival held in September. With so many unique sights and activities to offer, Tofino, British Columbia is one of the most interesting and beautiful places to visit in British Columbia. If you'd like to sample local wines and food at the Tofino Food and Wine Festival or see seals at play on a wildlife tour, Fresh Tracks can put together a vacation to Tofino, British Columbia that creates fond memories for a lifetime. Need more information on Gataways to Tofino in British Columbia? Talk to one of our Canadian travel Insiders who'd be happy to answer all your questions.